Pregnancy is a beautiful phase in a woman’s life. Therefore, to make sure everything is happening properly and the course of pregnancy is healthy, a pregnant woman is advised to undergo numerous tests and examinations. All of these tests are of high importance and shouldn’t be missed. Many of these tests are not only done to ensure that the health of mother is good but they are also done to ensure that the baby is healthy as well. One of such tests is the Double Marker test which is done to ensure that the baby’s development in the womb is normal and there are no anomalies and problems after birth. What is Double Marker Test? The double marker test is a simple blood test performed during pregnancy. It is done to screen anomalies that may be present in the fetus during its development in the womb. Usually, these anomalies are caused due to fault in the chromosomal development. Chromosomal abnormalities can result in serious health conditions and disorders which can affect the baby’s growth within the womb and affect the baby’s life adversely after birth. Chromosomal abnormalities such as Down’s syndrome and Edward’s syndrome can reduce the lifespan of babies that suffer from them after birth. The quality of life is also poor in babies who suffer from these chromosomal abnormalities. Double marker test can predict the possibility of chromosomal abnormalities like Down’s syndrome and Edward’s syndrome beforehand. Double marker test has proven to be very reliable. It is a test that shows accurate detections when it comes to chromosomal diseases. Double marker is quite an important test which needs to be done if the doctor suspects any abnormalities or issues present in the fetus during pregnancy. Double marker test is usually conducted between 9 to 13 weeks of pregnancy as an early detection of chromosomal abnormalities in the baby is important to decide the further course of pregnancy. How to Prepare for Double Marker Test? Usually, there are no specific preparations which are needed to be done. However, if you are taking any medications or undergoing treatment for a specific disease or disorder during pregnancy, it’s important for your doctor to know about them. Your doctor might advise you to quit taking the medication until the test is taken so that the results of the double marker test are proper. What is the Procedure of Double Marker Test? The double marker test is quite simple, it’s just a blood test combined with an ultrasound. First aim of the test is the measurement of the nuchal fold which is a translucent part found at the back of neck of a fetus by doing an ultrasound. Nuchal fold is properly visualised in the ultrasound and measured. Based on nuchal fold measurements further blood sampling test is done. 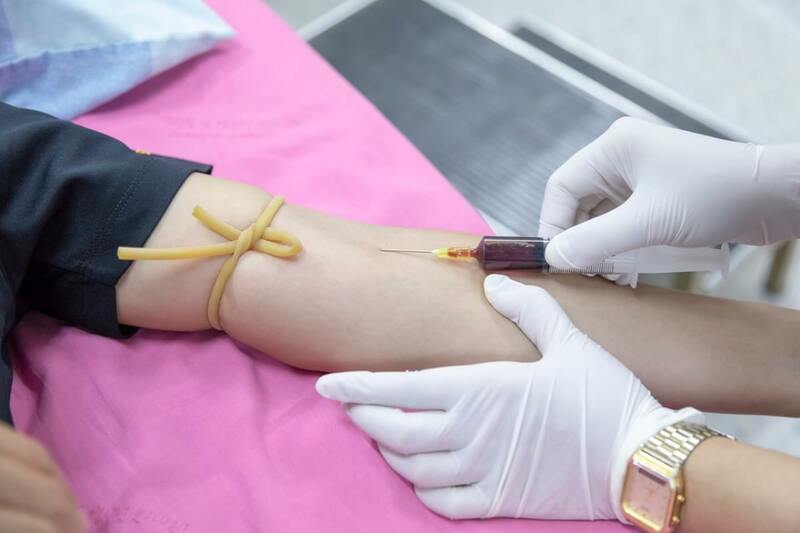 After the blood samples are taken they are processed and observed to check for a hormone called Free Beta Human Chorionic Gonadotropin and a protein called PAPP-A. An ultrasound may also be done to check fetal positioning, growth and development. Final Diagnosis is made according to the results of blood test and ultrasound. How to Interpret a Double Marker Test? A positive test sadly indicates that something isn’t right. If free Beta HCG is at a high level, there is a risk of Down’s syndrome. Low level of Free Beta HCG indicates that the risk of getting Edward syndrome is high. The presence of low protein in the test indicates the possibility of Down’s syndrome in the baby. Usually, when the test shows a positive result, doctors recommend to conduct further tests and advanced diagnostic procedures or measures to verify the double marker test and pinpoint the issues with the foetus. If positive results are obtained in advanced diagnostic tests and a neurological condition is diagnosed, the couple can choose to alter the course of their pregnancy by terminating it. It is important to take your doctor’s opinion on the same as well. Terminating the pregnancy can avoid further complications that can happen with mother and baby. Double marker test is not a very pocket-friendly test. Accuracy of the result depends upon the accuracy of equipment and materials used to perform the test. Result interpretation depends upon the doctor’s skills and opinion on the results. Well equipped medical facilities that can conduct Double marker test might not be available at all places. Down’s syndrome is a result of chromosomal abnormality.A healthy human has 46 chromosomes, while a person with Down’s syndrome has 47 chromosomes. This is also known as trisomy of chromosome 21. Presence of this extra chromosome can cause severe developmental abnormalities in the fetus during pregnancy. Your age while getting pregnant is higher than 35 years. You have history of having other children with Down’s syndrome. 1% cases have hereditary component as well, meaning it can be passed down in your family. Double marker test can help identify and verify the possibility of your baby having Down’s syndrome. Edward’s syndrome is a chromosomal abnormality and is caused due to abnormal chromosome pairs. Risks of your baby getting Edward’s syndrome are high if you have history of having other children with Edward’s syndrome. Double marker test can help identify and verify the possibility of your baby having Edward’s syndrome. Can I prevent chromosomal abnormalities? You cannot prevent the same. However, the possibility of your baby having a chromosomal abnormality can get significantly low if you lead a healthy life. So making good food choices and living a healthy lifestyle during your pregnancy should be your priority. You should be very careful during your pregnancy and try to keep yourself mentally and physically healthy as much as possible. Studies have shown that taking prenatal vitamins such as folic acid in recommended doses during pregnancy can reduce the possibility of chromosomal abnormalities. If the double marker test comes out to be positive, talk to your spouse and discuss what can be done. Take the opinion of your doctor as well. Terminating the pregnancy is always an option. Don’t weigh yourself down morally if you chose to do the same. If you’re pregnant meet your doctor and don’t miss appointments. Don’t miss prenatal vitamins and ultrasounds. Take the double marker test. A genetic counsellor can guide you well if you’re doubtful that your child can have chromosomal abnormalities. Meet your doctor and discuss about what you feel. Double marker test is a very important test. If your doctor recommends the same then don’t miss it. It can help you identify the issues with your pregnancy so that you can alter its course accordingly. Your focus should be on trying to achieve the best possible outcome of the situation you’re in. If you feel morally burdened meet your doctor and discuss about what you are feeling.